“Award-winning chef Michael Schlow announces the opening of his fourth area restaurant, on July 11, Casolare, located in the newly opened Kimpton Glover Park Hotel. Casolare is a rustic meets contemporary neighborhood restaurant offering authentic coastal Italian fare. Schlow and his team have created a menu of Italian dishes, gleaned from home cooks throughout travels to both Southern and Northern regions of coastal Italy, ranging from antipasti, wood stone-fired pizzas and a wide selection of seafood. After receiving high praise for his cooking at The Riggsby, Schlow tapped Chef Philippe Reininger to oversee the kitchen at Casolare, where he will offer seasonal preparations of staples like maltagliati with local crab, chiles, and green onions; and porchetta with orange zest, broccoli rabe, and fennel pollen. Lighter dishes such as a seafood salad “Capri style,” a crudo of the day, and swordfish with spicy eggplant caponata and salsa verde will balance out heartier dishes and wood-fired pizzas. In addition to dinner, the restaurant will serve lunch and breakfast, and the latter will offer pressed juices, smoothies, and wholesome options such as an organic brown rice bowl with poached eggs, avocado, radish, bacon, and tiny tomatoes. Designed by Edit Lab at Streetsense, the 156-seat restaurant evokes a rustic yet refined Italian atmosphere, with terracotta-inspired herringbone tile floor throughout the dining room and bar under an oak-clad ceiling. A diamond-shaped marble mosaic tile on the front of the bar picks up light throughout the day, and an Italian marble pizza bar counter serves as a backdrop to a tiled wood stone pizza oven. Green and blue booths line the walls, inset into textured plaster arches. Bar lights wrapped in stitched leather and dining room lights in burlap and glazed ceramic round out the feel of the space, creating a richly textured room. Tyler Vaughan, formerly of Union Square Hospitality Group in New York, has relocated to Washington to oversee Casolare as general manager. A list of Italian wines, local beers, and cocktails created by bartender Christine Kim and assistant general manager Lindsay Greene will provide guests with a well-edited selection of beverages. Offerings include several classic Italian cocktails on draft such as an Americano, Spagliato, Negroni, Old Pal and Boulevardier, along with unique creations such as the “Savoy Sour” made with gin, Aperol, chamomile, lemon and lavender bitters. 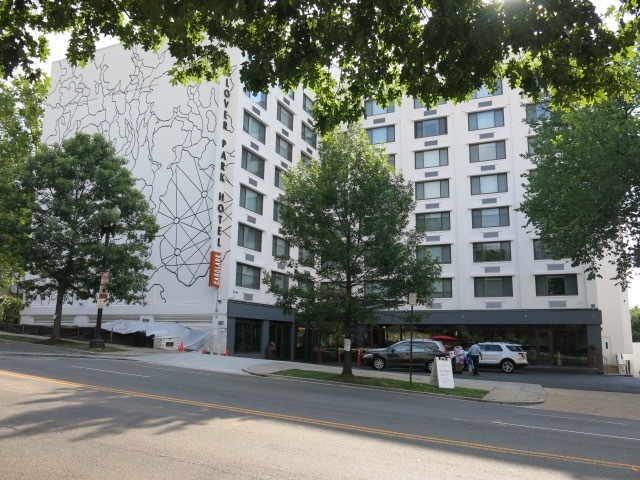 In addition to the restaurant menu, the team at Casolare will also oversee in-room dining and events for the Kimpton Glover Park Hotel, which recently re-opened after a multimillion-dollar renovation, and is a collaboration between Kimpton Hotels & Restaurants and D.C.-based developers Foxhall Partners and Iron Point Partners. The group also manages The Carlyle Dupont Circle, where The Riggsby is located.